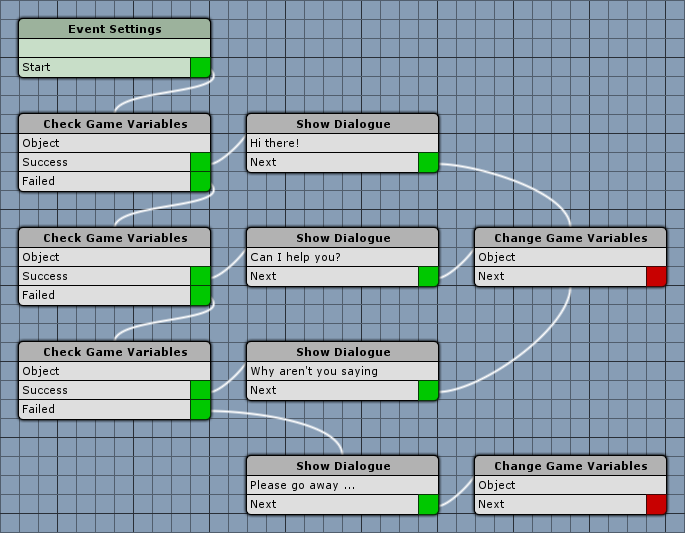 We’ve already created dialogue events – but this time we’ll use Object Game Variables to cycle through different dialogues when talking to the NPC multiple times. You can learn more about game variables in general in this how-to. We’ve already added some NPCs, so let’s get on with it. Open the town scene (1 Town, can be found in Assets/Tutorial Resources/Scenes/) and add the NPC_purple prefab (can be found in Assets/Tutorial Resources/NPCs/). I’ve added mine on the right side of the tree. The object variables component will automatically generate an Object ID for us – this ID is used to keep track of the game variables bound to this object. 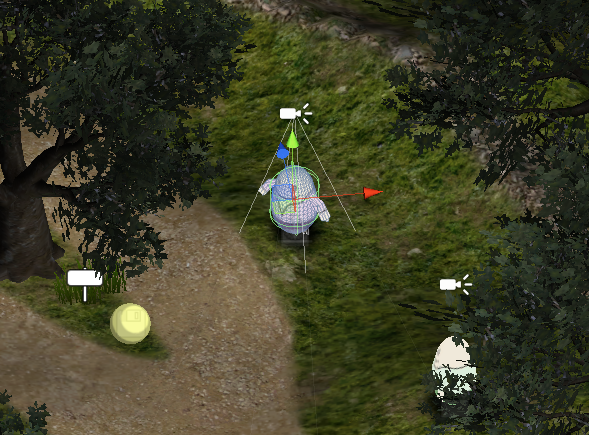 Similar to shops, all game objects sharing the same object ID will also share the same game variables. Finally, we’ll add an Event Interaction component (Add Component > Event Interaction). Click on Create New Event in the object’s inspector to open the ORK Framework editor and create a new event for our NPC. This event will, similar to our quest event, display different dialogues depending on a Game Variable – but this time, it’s an Object Game Variable. We’ll use a float variable named counter to cycle through the different dialogues, the variable is increased by 1 every time a dialogue has been displayed. After the last dialogue, we’ll reset the variable. We’ll need one actor, so click on Add Actor. That’s it for the event settings. First, we’ll check if counter is set to 0 – by default, all float variables (also those who haven’t been used) are 0. We’ll use an object of the event, else we could define the Object ID of the object variables. Our first dialogue – connected to the Success slot of the counter is 0 check. This step will increase our counter by 1 – we’ll use this step multiple times. The 2nd variable check will check if counter is set to 1. This step is connected to the Failed slot of the counter is 0 check. The 2nd dialogue is connected to the Success slot of the counter is 1 check. Set to: Can I help you? Connect the Next slot of this step to the Change Game Variable step we created earlier. The last variable check will check if counter is set to 2. This step is connected to the Failed slot of the counter is 1 check. The 3rd dialogue is connected to the Success slot of the counter is 2 check. Set to: Why aren’t you saying anything? The last dialogue is connected to the Failed slot of the counter is 2 check. Finally, we’ll reset the counter to 1 – i.e. the first dialogue will only appear once. And that’s it for the event – click on Save Event and save it as changingDialogue in Assets/Events/Town/. Close the ORK Framework editor. 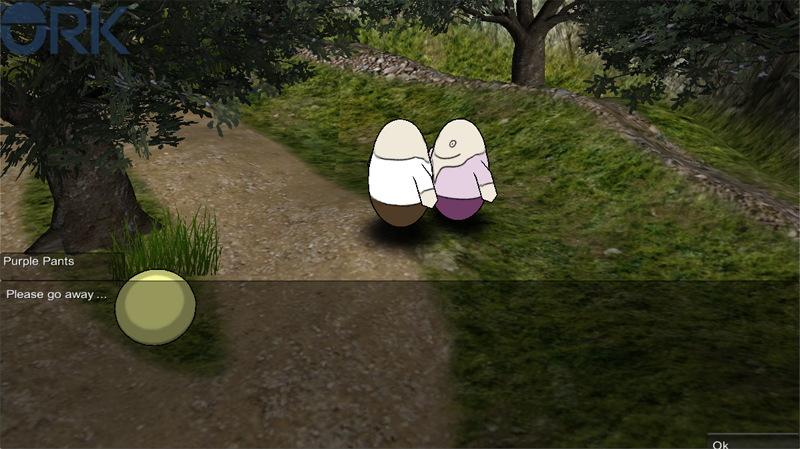 Now, back in the town scene, let’s add the event to our NPC. Change the following in the Event Interaction inspector. Click on Ok to accept the selected event. Open the main menu scene (0 Main Menu) and hit play. Go and talk to Purple Pants multiple times. Since we’re using an Object Game Variable, we can use the same variable key (counter) in other events as well, without interfering with the dialogues of Purple Pants. When saving, the object game variables will also be saved (when set up that way in the Save Game Menu). And that’s it for now – the next lesson will cover item collectors.